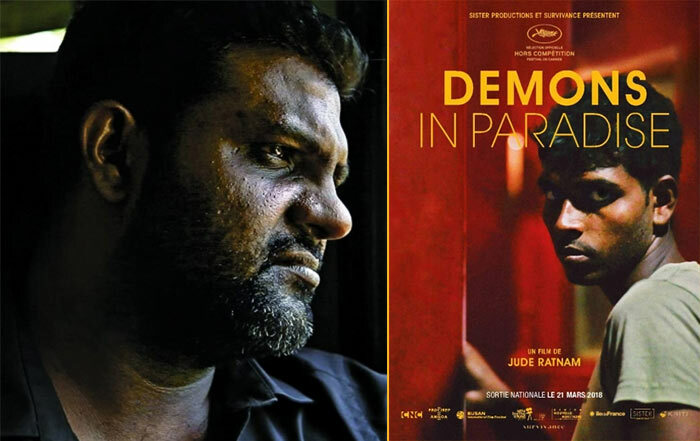 Regarded as the first Tamil filmmaker to openly criticize the LTTE, Jude Ratnam says he is not surprised by the backlash but insists his film ‘Demons in Paradise’ can help foster reconciliation between the Tamil and Sinhalese community in Sri Lanka. By his own admission filmmaker Jude Ratnam is a “traitor”. A Tamil himself, he blames the Tamil Tigers for many of the atrocities carried out in Sri Lanka’s civil war. The director told BBC Asian Network’s Nalini Sivathasan why he feels the way he does. “When the war was coming to an end, I wanted the [Tamil] Tigers to lose the fight. I wanted it to end, even if my own people had to be killed,” Ratnam says. The war did end in 2009, with the Sri Lankan government defeating the Tamil Tigers. It came at a huge cost though, as many Tamils died in the final offensive. Nearly a decade on from the end of the war, Sri Lankan filmmakers are tentatively re-examining the 26-year conflict. Tamil directors, including Nirmalan Nadarajah and Gnanadas Kasinathar have subtly criticised the Sri Lankan government, which was accused of targeting civilians and carrying out extrajudicial killings. But Ratnam goes further. In his film Demons in Paradise, he became the first Tamil filmmaker to openly criticise the Tamil Tigers. The Tamil Tigers were notorious for carrying out suicide bombings and recruiting child soldiers, but to many Tamils – both within and outside Sri Lanka – they were heroes. But Ratnam’s belief is that the rebels committed the most brutality to their own community – the Tamils they were meant to be defending. The film looks at the Tamil nationalist groups which emerged from the 1970s in response to anti-Tamil violence. But these factions started killing each other, with the Tamil Tigers emerging as victors. In one massacre, it reportedly killed hundreds of members of the rival Tamil Eelam Liberation Organisation (TELO). Ratnam follows his uncle, a former fighter for a rival Tamil organisation, as he meets other critics of the Tamil Tigers. In one scene, a man describes the torture meted out by the group. Demons in Paradise has received critical acclaim since its premiere at the Cannes Films Festival in 2017. In Sri Lanka, the Sinhalese-dominated press has also praised the film. A local newspaper called it “the most honest, courageous and important piece of art on Sri Lanka done by a Sri Lankan”. Most of the Tamil Tiger leaders were killed in 2009, so audiences will never know their response to the allegations in Demons in Paradise. Among the wider Tamil community, however, there has been anger. Athithan Jayapalan, a Norway-based academic who specialises in Tamil identity, doesn’t dispute the crimes committed by the Tamil Tigers. However, he thinks the film is misleading for foreign audiences who may be unfamiliar with the civil war. Mr Jayapalan believes the crimes committed by the Sri Lankan government far outweigh what the Tamil Tigers did. Ratnam says his focus on the Tamil Tigers was intentional – to warn the Tamil community, especially those living abroad, about romanticising the group. But Sri Lanka-based human rights lawyer Mathuri Thamilmaran disagrees. She saw Demons in Paradise in the capital Colombo, and asks why Ratnam has avoided screening the film in Tamil areas of the country. In the past decade, a semblance of peace has returned to Sri Lanka. But the reaction to Demons in Paradise is another example that Sri Lanka is still very much divided along ethnic lines. Jude Ratnam says he is not surprised by the backlash but insists his film can help foster reconciliation between the Tamil and Sinhalese community in Sri Lanka.